Waffles and Egg in a Hole are how dreams come true! 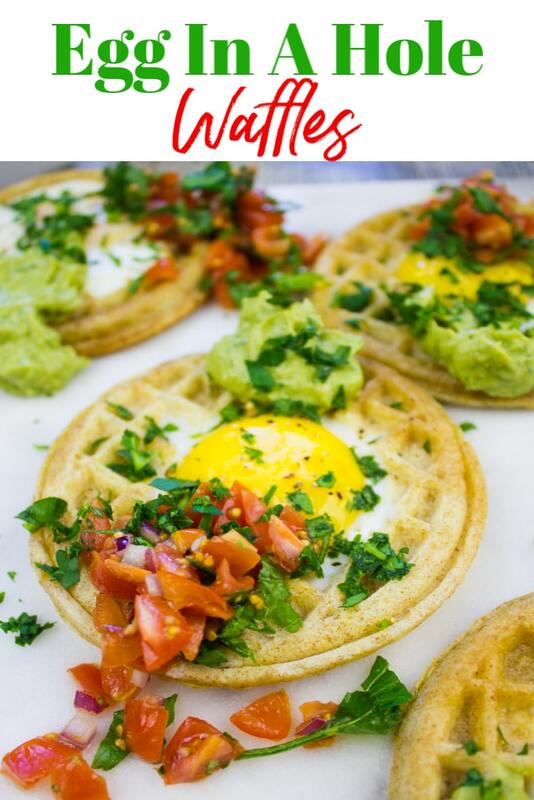 Imagine the perfect crispy buttery waffles and creamy eggs, topped with Pico de Gallo and Guacamole. I have a confession to make. I LOVE waffles for breakfast, but I don’t do well with sweet waffles. I know, it’s probably unheard of. I prefer my breakfast waffles with eggs or cheese, and I love to sweeten my waffles with just a touch of jam. If you’re skeptical, well today’s luscious recipe will change your mind. So read along and check the recipe video to make yourself a crispy waffle recipe for breakfast too! First of all, let’s start with the waffles. 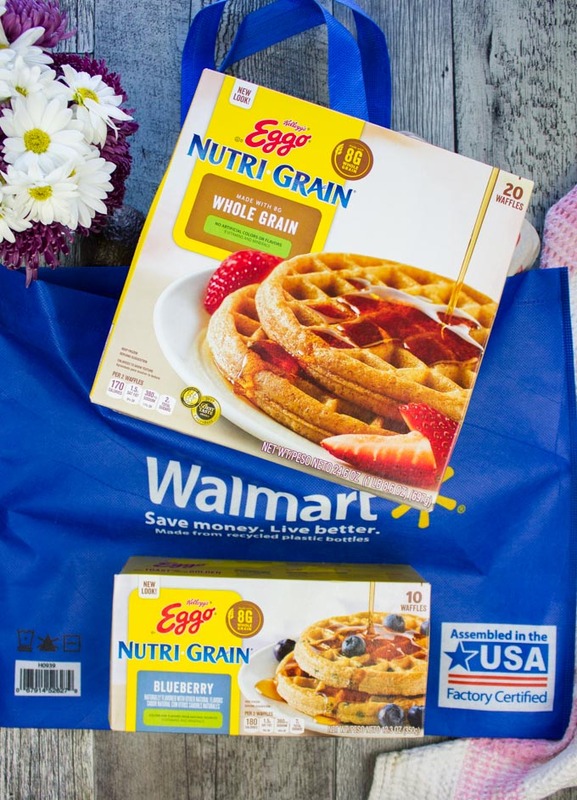 I’ve used the New Kellogg’s® Eggo Nutri-Grain 20 Ct. They’re loaded with 8 grams of whole grains, awesome source of fiber, and taste just like your homemade waffles! They’re all Indulgent, on the go, delicious and filling! 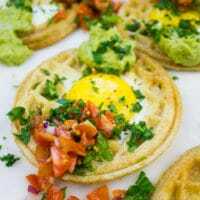 The egg in a hole waffles are everything you love about the egg in a hole recipe plus everything you love about crispy waffles recipe. Make sure to cut out 2 inches in the center of the waffle and make sure not to use jumbo eggs. Large eggs are better because they fit the 2 inch center perfectly. I love searing the waffles in butter on both sides before adding in the eggs in a hole, and that’s just for flavor so it’s completely optional. Covering the pan allows the egg to cook well. It’s probably a variable how many minutes, because some like their eggs more runny than others. So best things is ti keep an eye on them. Toppings like Pico de Gallo and guacamole are so good here, however again they’re optional. You can opt for shredded cheese instead. Since it’s a New Year and we’re all sticking to some lighter meals, I chose those toppings. The cut out centers of each waffle are great when toasted and used to scoop up jellies and jams! Yum! Pick up the New Multigrain Eggo and leave them out at room temperature for just 30 minutes to soften up a bit. Preheat a nonstick skillet over medium heat with a tablespoon of butter. In the meantime, you’ll cut our 1.5-2 inch holes in the center of each waffle using a cookie cutter. Start by adding one waffle at a time, or probably two waffles depending on the size of your skillet. Just toast the waffles in the butter for less than a minute and flip. Add the egg right in the center of each waffle. Now you need to cover the skillet with a lid or foil, and allow the eggs to cook for 2-3 minutes depending on how well you prefer your eggs to be. 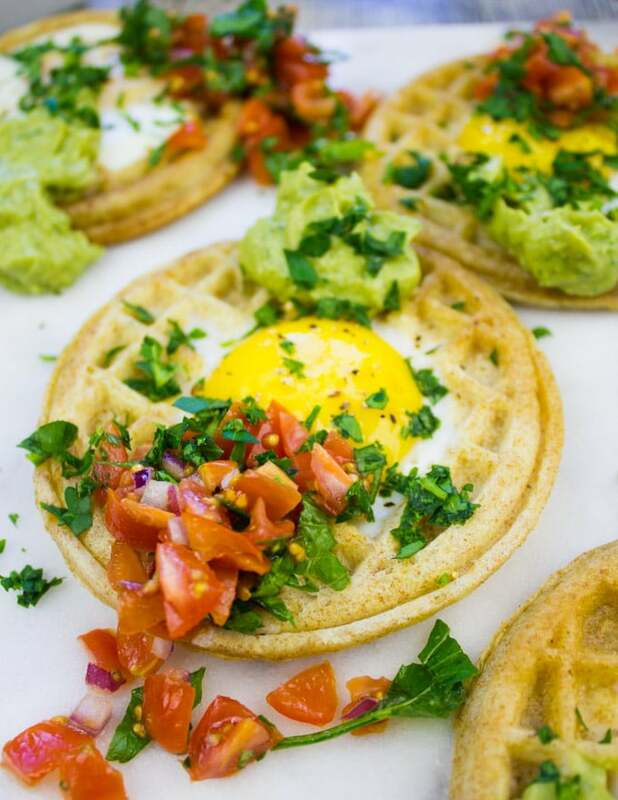 Remove the eggs in a hole waffles and start layering the toppings, sprinkle some fresh parsley and enjoy right away. 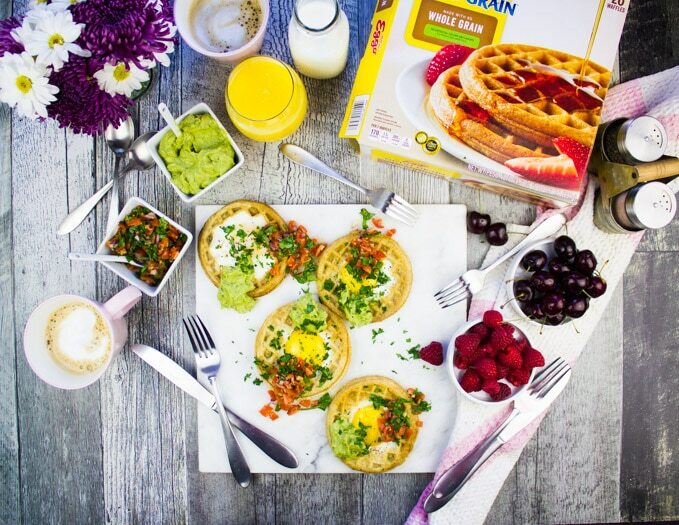 Start with quality waffles such as Eggo Nutri Grain. Use a 1.5 inch to 2 inch cookie cutter, any shape works. Make sure you use large eggs, not bigger since the eggs in a hole are supposed to fit exactly in to the center of the waffles. Cover the skillet as soon as you put the eggs in the center so that they start to cook without browning the waffle bottoms too much. Keep an eye on the eggs because everyone likes them differently. Serve the eggs in a hole right away with different toppings. You can rewarm the eggs in a hole in the oven, but keep in mind the eggs will continue cooking. Use the cut out waffle centers to scoop up jam! Remember to toast them first in a toaster. Preheat a nonstick skillet over medium heat. Add half a tablespoon of butter. Take a 1.5 inch or 2 inch cookie cutter and cut out the center of each Eggo waffle. Keep the centers to toast and use later with jellies and jams. Put one or two waffles at a time depending on the size of your skillet and toast in the butter for less than a minute. Then flip the waffle and add in the egg right in the hole. Cover the skillet and allow the eggs to cook to the doneness you prefer (anywhere from 2-4 minutes). Uncover the skillet, season the eggs with salt and pepper. Serve right away with toppings. 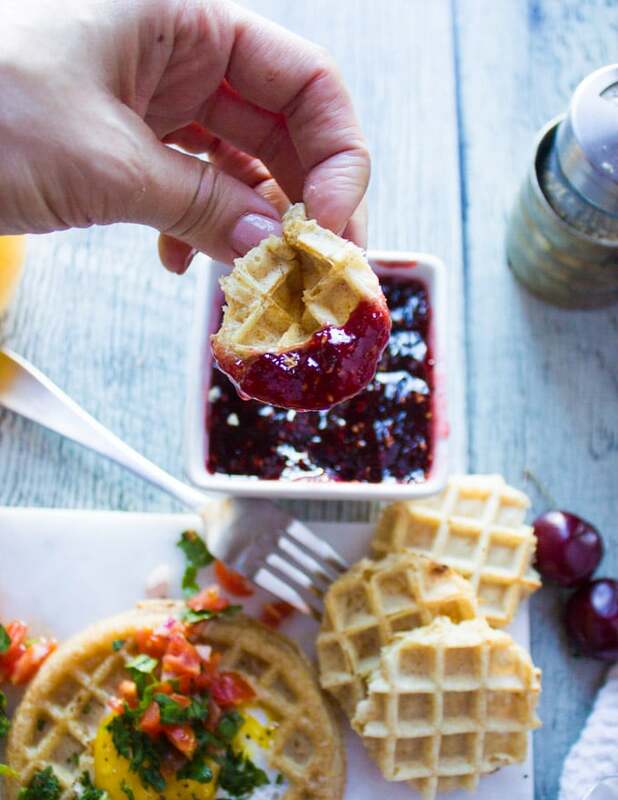 Toast the waffle centers and use them to dip/scoop jellies and jams. Start with quality waffles such as Eggo Nutri Grain. Use a 1.5 inch to 2 inch cookie cutter, any shape works. Make sure you use large eggs, not bigger since the eggs in a hole are supposed to fit exactly in to the center of the waffles. Cover the skillet as soon as you put the eggs in the center so that they start to cook without browning the waffle bottoms too much. Keep an eye on the eggs because everyone likes them differently. Use the cut out waffle centers to scoop up jam! Remember to toast them first in a toaster. Serve the eggs in a hole right away with different toppings. You can rewarm the eggs in a hole in the oven, but keep in mind the eggs will continue cooking. This would be such a great idea for weekend brunch! Love the hack of using premade waffles! hahah Sabrina, absolutely!! Sometimes you need the hacks! 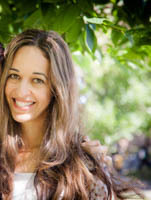 Thanks Paula!! It was absolutely delicious! Waffles are so much better Paula!! WHAT?!??! I love egg in a hole’s but I never thought to do in a waffle!!! LOOKS AMAZING! Thanks Allyson!! This is seriously so GOOD! This breakfast sounds like a great addition to any families table. I know mine would devour it. This is such a fun breakfast! Looks so good! I’d love to try this, such a perfect way to start our day! Melanie you need to make this! 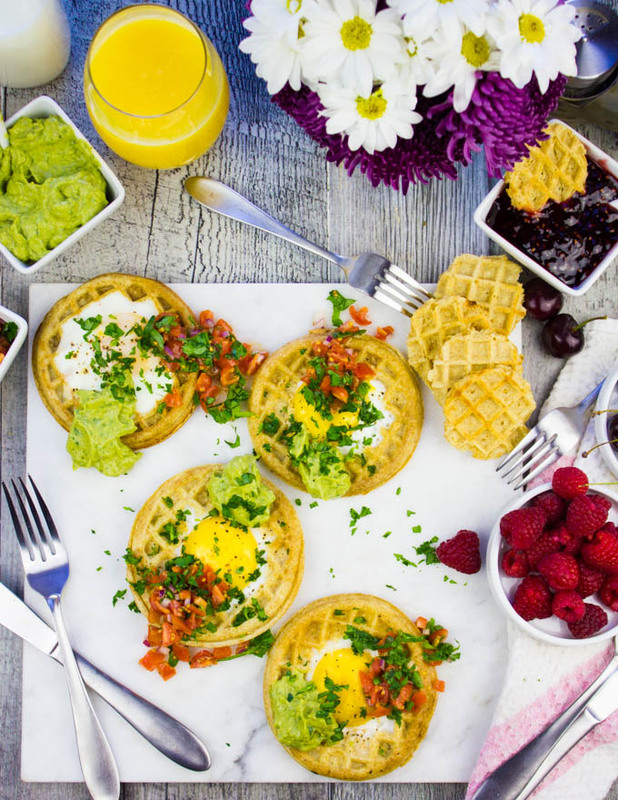 what a great idea to make egg in a hole waffles – such a fun twist! this is an awesome brunch idea! You are a girl after my own heart! I love savory for breakfast and not sweet. Your egg in a hole waffles would be a breakfast Hubby and I would love. Add a bit of spice to the eggs and we’re happy. I love crunchy waffles and yours look like they’d be perfect. And for the sweet lovers? Put some fruit on them and whipped cream. That would keep them crunchy. That’s brilliant Marisa to make a sweet version!! Hope you try this one! We make this with toast, but I am loving the idea of making it with waffles! My boys would love this recipe and I can’t wait to make it. Oh my gosh, this is like toad in the hole but 100 times better!!! I absolutely love the idea of pairing with the guac and pico de gallo, the perfect brunch recipe. I need to add the ingredients to my shopping list, STAT. Egg in a hole is our favorite breakfast. I’ve never tried with waffles! I know my family will go crazy over this! hahahaha now it’s the time to try this Catalina!